Walking your dog not only gets your dog some exercise and fresh air, but maybe you can also find stolen money and unravel a caper. In Moscow, a man was walking his dog in the forest and found almost $700,000 in cash. The man reported his findings to the police and investigators traced back the cash to a bank robbery a week and a half ago. 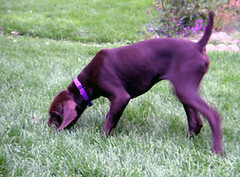 Have your dog sniff around a little longer the next time you’re out on a walk. This entry was posted on Wednesday, May 23rd, 2007 at 3:45 am	and is filed under Dogs, National Dog, Cat & Pet Info, News for Cats, Dogs & Owners. You can follow any responses to this entry through the RSS 2.0 feed. Both comments and pings are currently closed.